The most formal suit combination for a modern man is a navy suit, white shirt and silver tie. When that tie is a woven like a Macclesfield, it is a classic wedding combination and much more suitable to being married in than the tuxedos so favoured in the US – and looks more elegant without the fancy waistcoats that blight many English weddings. One step down on the formality, the smartness, is a blue shirt instead of white. The contrast is reduced and the whole look softened. It is sleek enough for evening and not too stark for business. 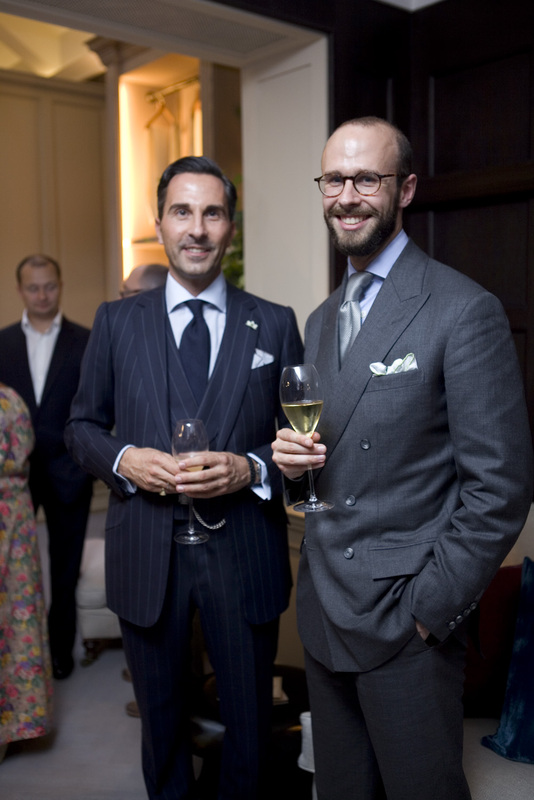 This is my favourite combination for evening events such as the Rake/Anderson & Sheppard/Bryan Ferry party a couple of weeks ago, at which I am pictured above with Alexander Kraft of Sotheby’s. Diego Della Valle of Tod’s is also a great exponent of the look. The choice of navy or grey suit makes less difference that that change of shirt colour. Alexander, a contributor to The Rake and a Ralph Lauren ambassador/model alongside his day job, is wearing what I think of as a more classic Italian combination of navy and blue. The suit is by Cifonelli. My suit is Anderson & Sheppard, the shirt Kiton, the tie Tom Ford and the handkerchief a lovely grey and mint green design from Lissom & Muster. My only regret (there’s always one) is that the tie knot wasn’t tightened rather more. It is too chunky in the tie space available. More photos from the evening here. You can follow the discussion on My favourite formal combination by entering your email address in the box below. You will then receive an email every time a new comment is added. These will also contain a link to a page where you can stop the alerts, and remove all of your related data from the site. I like the grey suit, Simon. Would you be able to reveal what the cloth is? The reason being that I’m looking to have a grey double-breasted made up in the next year or so and would like some inspiration! Thanks very much. Diego Della Valle’s great friend and some time business partner Luca Cordero di Montezemolo is also a notable exponent of this look, although often with woollen or cashmere ties rather than silk. Personally I think you look sharper than the (also sharp) gentleman next to you: the combination of greys, blue and white is fantastic in your outfit. One question on collar points: what do you think of the emphasis on having your collar points covered by the lapels of your jacket? I am reminded because this is the case in both of your outfits above. I certainly think it looks much sharper; I only have one shirt that does this (quite a wide spread collar) and think it looks better than all of my other shirts. I have broad shoulders and it’s difficult finding collars wide enough. I recall reading on Parisian Gentleman that if the shirt’s collar’s aren’t wide enough to be covered by the lapels of your jacket, the shirt’s cut doesn’t suit you and it should therefore not be purchased. I have seen the ever-dapper Patrick Grant in photographs where he doesn’t have them covered, however, but do think it looks much better on the whole when they are. Any thoughts on this? It’s certainly a good guide, but I wouldn’t put it in as extreme terms as Hugo. I like the optical glasses frame you are wearing in the picture, they look great. Are they bespoke made or purchase off the shelf and who is the designer. Off the shelf, from Francois Pinton. Bizarrely, given how strong the name is in France and elsewhere, they were available at my optician round the corner from the office for £80. I wanted to pose a question that I don’t believe I have seen addressed in detail on your site. It deals with your rules on tuxedos and/or formalwear. I am going to be in a wedding next year and the groom has allowed us the freedom of selecting a tuxedo of our choice so we can have one long term. I go back and forth between the new trend of navy blue and the traditional black. I was curious to get your thoughts on this topic along with the details of the tux. Peak lapels vs notch, etc. Also, thank you so much for continuing to feed the interest of so many men out there in bespoke menswear. I look forward to each new post. Thanks Michael. Do spread the word – it’s what made and continues to make this blog successful. I have no personal view on black v midnight, but I went for black (see Richard Anderson pictures). There is a small chance you might regret midnight in the future, or decide it looks dated. No such chance with black. As always, much appreciated. I was joking with my wife the other day when she showed me picture’s of Clooney’s Armani tuxedo for his wedding. I said, that will never, ever go out of style. Was just reading your post on your NYE tux, which led me to this post…Was compelled by your comment that a navy suit, white shirt and silver tie is more suitable for a wedding that a tuxedo, and would love to hear more of your thoughts on why. I’m particularly interested because I’m getting married in July in Vermont, and am starting to think about what I should wear. Any suggestions (outside of the navy suit, white shirt and silver tie)? Simon, solid outfit you have on, sir! I’m looking for an affordable spread collar shirt(white). Could you point me in the right direction? Thanks. What do you mean by ‘affordable’?